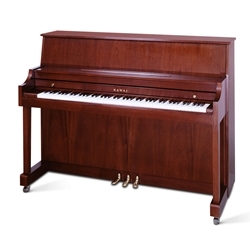 Never before has there been an upright piano so well built, yet so amazingly affordable. The 506 was specially designed to meet the needs of those who require high quality and durability in an instrument... without a premium price tag. The 506 embodies three fundamental elements of a fine pianoâ€”an exceptional soundboard made of solid spruce, a durable back assembly with sturdy back posts, and our exclusive Ultra-Responsive Direct Blow Action. These important elements ensure a level of tone, touch and durability that will satisfy the needs of any pianist. Finally, we added a handsome cabinet with a sturdy "toe-block" design. The result is a finely crafted, superb-sounding instrument that will bring you satisfying musical enjoyment for many years to come.